Summer is half way over & before we know it Fall will be making its infamous debut. Which means it will be time to head back to school, crack down at work & say hello to cooler weather! To be honest, I am ready for cooler weather so that I can pull out my comfy jeans, cozy cardigans & darker hues like navy & brown. I am not wishing summer away by any means, but Fall weather is seriously one of my favorite times of the year. I know skinny jeans have been the fad for some time, but these boyfriend jeans are certainly becoming my new favorite (no pun intended!). They are super casual, really comfy & they go great with this peep toe bootie or a knee high riding boot. Pairing the favorite boyfriend denim with this floral + lace top, along with the white ribbed over-sized cardigan helps keep the summer breezes at bay & welcomes the cooler temps as they start to arise. Be sure to stop by the AEO blog & check out other back to school denim favorites! The Weekly Favorites link-up is held on Wednesdays. We encourage you to share anything and everything you're loving each week! 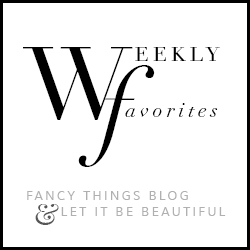 If you're linking up, we ask you to please follow both Kristin + I socially and share the official button on your Weekly Favorites post!